With growing interest in flexible working space especially in Klang Valley, WSPACE (M) Sdn Bhd has launched its co-working space in Mid Valley City, here. The RM3.6 million investment will provide flexible co-working office space for small and medium enterprises and start-up companies. According to founder and chief executive officer of WSPACE, Wang Li, the facility offers 12,600sq ft of fully-furnished, premium workspaces with both dedicated private work and meeting areas as well as lifestyle social spaces for people to work, innovate and collaborate. “Co-working spaces are becoming mainstream, providing start-ups, small business teams and entrepreneurs a flexible and cost effective option to quickly set up and operate their business. More importantly, create co-working spaces a platform to further boost business collaborations and exchange of new ideas,” he said. 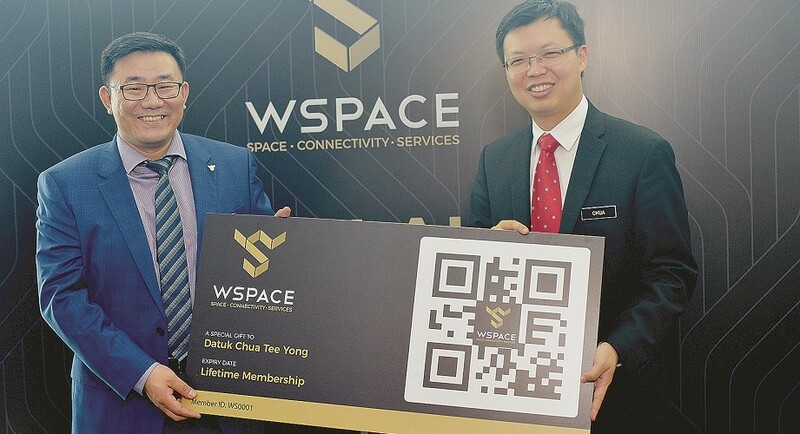 Wang (left) presenting the WSPACE lifetime membership pass to Chua during the launch. WSPACE will be equipped with complimentary high-speed internet connectivity and access to on-demand front desk, financial, human resource and legal support services for ease of doing business. Deputy Minister of International Trade and Industry Datuk Chua Tee Yong, who officiated at the launch, said the trend of co-working started out as an affordable alternative to traditional office environments. Today, this concept has evolved into a critical component of the entrepreneurship ecosystem. “It provides not only the infrastructure, but more importantly a collaborative environment that boosts entrepreneurship and innovation. This in turn, I believe, will contribute to sustained economic growth for Malaysia,” he said. Users will be able to access WSPACE services from as low as RM159 month with the starter package. Wang said the opening of WSPACE sets a new benchmark for the co-working lifestyle in Malaysia. “It will be the first co-working space in Asia to use a groundbreaking mobile management app (MAM) to automate daily business tasks. Simple tasks like office space check-in and check-out, meeting room booking, front desk services, meeting invitations and payment can be done in just a few clicks using the WSPACE mobile app,” he said. WSPACE has received good response with over 60 per cent of its dedicated office space reserved since the soft launch in October 2016, he added.